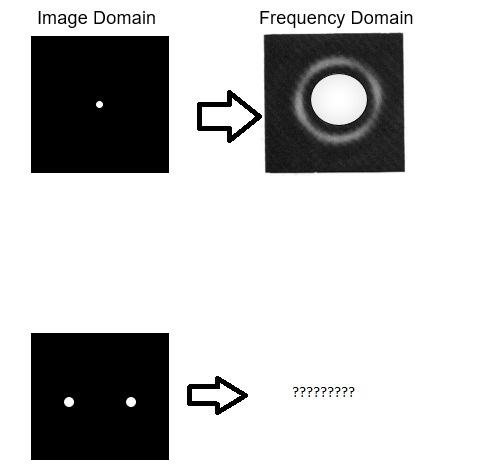 the question is: given an image and its fourier transform, find another image fourier transform ,using fourier properties to explain why it would look like that. Imagine the same problem in 1-dimension and you will be able to find the answer. Hint: If you know the Fourier transform of a delta function (or time-shifted delta function) and the Fourier transform of a rectangular window, then you should be able to answer the above problem. P.S. Cannot comment because I need 50+ reputation to do so. Not the answer you're looking for? 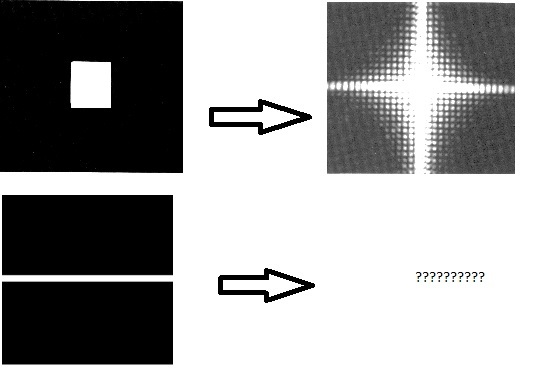 Browse other questions tagged image-processing fourier-transform computer-vision or ask your own question. Obtaining the frequency and phase spectra from fourier transform? Is it possible to reconstruct an image using its magnitude only? How to find phase values on precise pixel locations of a given Image? Why Fourier transform is not sufficient and we have to use Laplace transform?